Comic Book Backstory: Who Is Grandmaster? Many people wish they could be immortal, but in doing so they would face one of the biggest dangers in the universe: eternal boredom. As such, a hobby is required. Some choose to explore the world, some choose to read books, some choose to host intergalactic contests where the universe’s best super-beings take part in battles of high stakes. Such is the case with En Dwi Gast, aka Grandmaster. Little is known about Grandmaster’s past before he became part of the Elders of the Universe. Only that, like his fellow Elders of the Universe, he was part of one of the first humanoids species to be created after the Big Bang and he’s the last survivor of said species. He eventually joined the Elders of the Universe who considered themselves brothers since they were the last of the species that lived in the first galaxies. Being virtually immortal, each Elder had to come up with a hobby or an area of expertise to avoid eternal boredom (the Collector would spend eternity collecting all types of species and artifacts, for example). In Grandmaster’s case, he decided to explore many civilizations in hopes to learn and master every single type of game. Once achieving such goal, he started hosting tournaments featuring various opponents in all sorts of games for high stakes. His standard method was to pick a team of champions and let the other opponent select his own team and the two would take part in combat. One of his first tournaments was with the time-traveler Scarlet Centurion were he pitted his team, the Squadron Supreme (heroes from an alternate earth who are pretty much Marvel’s Justice League) against their arch-enemies, who were part of Scarlet Centurion’s team. 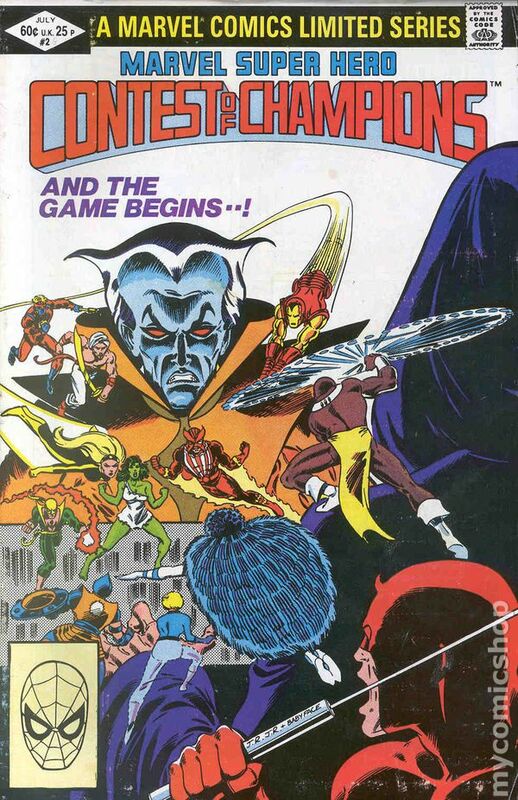 After winning, Squadron Supreme refused to participate in more of Grandmaster’s games, so he created evil versions of the Squadron’s members Whizzer (Marvel’s the Flash), Nighthawk (Marvel’s Batman), Doctor Spectrum (Marvel’s Green Lantern) and Hyperion (Marvel’s Superman), forming the Squadron Sinister. He finally came to Earth in his first comic book appearance, Avengers #69, created by writer Roy Thomas and artist Sal Buscema on 1969. Here, Kang the Conqueror (one of Avengers’ arch-enemies and an alternate version of the Scarlet Centurion) pitted the Avengers against the Grandmaster’s Squadron Supreme and later the Invaders (World War II’s Avengers) also summoned by Grandmaster, with the fate of the world at stake. Fortunately, Kang won and ever since Grandmaster has envolved Earth’s heroes in many of his tournaments because of their prowess. He almost turned the Earth into his own personal battle arena when he pitted the Defenders against Dr. Doom’s robot gamesman, the Prime Mover, but he lost that opportunity in a bet with Daredevil, one of the Defenders (you know you have a gambling addiction when you gamble the right to rule the Earth). 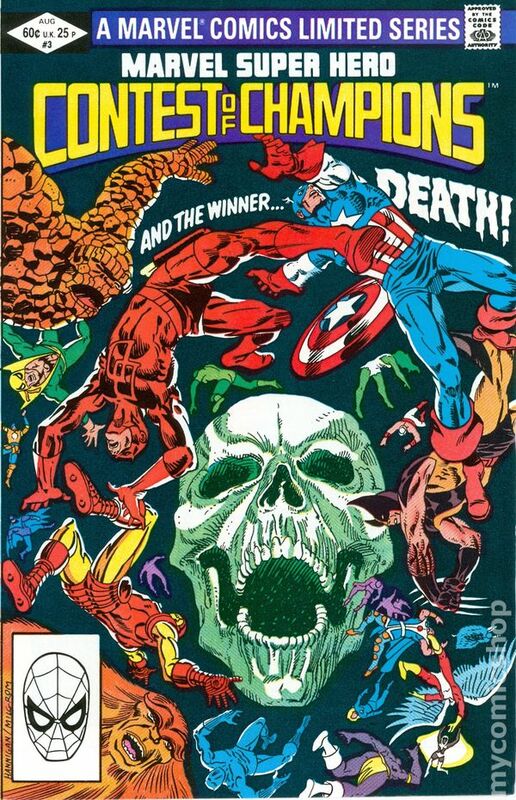 When death finally came for Grandmaster’s “brother” Taneleer Tivan, the Collector he challenged Death to a tournament where each would have a team of superheroes from Earth and both teams would fight it out, in an event that became known as the Contest of Champions. Grandmaster won the right to bring the Collector back to life but he had to give up his own life to do so. With his brother dead, Collector decided to also challenge Death for Grandmaster’s life. It’s not known how it took part except that it ended with Collector alive and Grandmaster ressurected. Grandmaster later used the Avengers to challenge Death yet again, and won eternal life for all Elders, himself included. But instead of finding a new hobby he just kept on doing what he did best: hosting tournaments were superheroes fight for high stakes. Well if it ain’t broke, don’t fix it. As an Elder of the Universe, Grandmaster is an extremely powerful being. He can teleport to any point in time, space and reality at the speed of thought and can control matter at a planetary scale as well as project energy blasts. And like all Elders, he is completely immortal, immune to any form of aging, disease or injury. He also possesses encyclopedic knowledge of games and game theory. Due to his habit, as well as gift, for hosting tournaments of high stakes between teams of superheroes/supervillains, Grandmaster has appeared in many cartoons and videogames. And now his finally making his cinematic debut in Thor: Ragnarok, directed by Taika Waiti and starring Chris Hemsworth as Thor, Mark Ruffalo as Hulk and Tom Hiddleston as Loki, set to release on November 3, 2017. The character will be portrayed by Jeff Goldblum, known for his roles in Jurassic Park and Independence Day. Reading recommendations: Avengers #69-71, Marvel Super-Hero Contest of Champions #1-3, Avengers Annual #16 and New Thunderbolts #15-16. Fun Fact: In JLA/Avengers, Grandmaster challenged DC’s Krona for a tournament between the Avengers and DC’s Justice League. But Krona made things interesting by choosing the Avengers to represent him, with Grandmaster having the justice League as his team. Did you like this article? What more would you like to know about Grandmaster? Leave your thoughts in the comments below and stay tuned for more about the new characters coming to Thor: Ragnarok. And for more Marvel-related articles, be sure to follow Geek Motivation on Twitter (@GEEKMOTIVATION) and me (@Miguel420Coelho). ‘Till next time!